We are pleased to announce that we have introduced a raft of advanced and robust features for our Back4App users. The motive behind implementing these features is to get our customers more productive and secure. These facets are simple yet pretty effectual, and you can customize them without any difficulty. So let’s check them out! To start, we have made a significant change in our security environment and now officially rolled out the “Multi-Factor Authentication (MFA)” feature. We are always concerned about the security of your data/apps so to increase the security now we allow the addition of one more authentication layer on login. This will help you to protect our apps from improper account access or cyber attacks such as malware, spamming, phishing and password dumps. To learn how to configure the MFA feature for your Back4App account, check this MFA tutorial. Next, we are excited to hand out our new amazing feature “custom access,” which will make it easy for our beloved users to collaborate with others and work as a strong team. This cutting-edge feature is created to give your team members access to specific areas of your app. In this, you will have the privilege of customizing access and settings on a personal repository. When inviting and adding collaborators to your app, you can grant Read/Write/None access to them. By this means, your collaborators will only be able to perform a task based on the permission type you’ve set for them. They will be allowed to either write (can create, add, modify) or read (can view but can’t edit) your app’s feature. For instance, if you want your collaborators to run recurring tasks, such as updating data, then provide them with the write access, as shown in the above image. And they will be able to schedule and handle background jobs via the dashboard. That way, you don’t have to be alarmed about interrupting other foreground operations of your app. If you don’t know how to add multiple collaborators to your app, please read How to add a collaborator to your Back4App account tutorial. Last but not least, we are empowering our users with the two-in-one “custom domain” feature, which combines the sheer power of live query with the convenience of reliable web hosting. 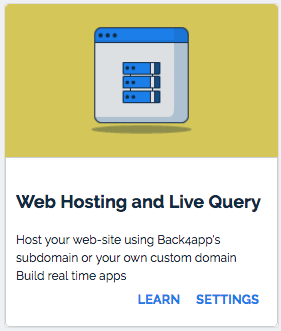 Previously in Back4app, it was possible to host your web pages using the subdomain *.back4app.io. 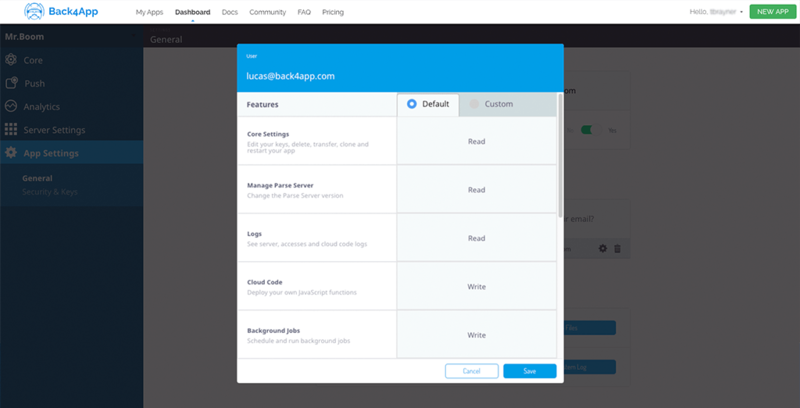 Now we improved this feature and you can use your own domain and host your web pages using Back4app’s secure hosting, is a guarantee that this platform is an attractive choice for app development! Not only can you build real-time reactive applications using our live query feature, but can also host and scale those apps using our robust web hosting facet. And the best part is: there’s no need to use two different platforms to develop and host apps since you can perform both tasks simultaneously with one single platform, and, i.e., Back4App. Isn’t it great? So, what are you waiting for? Log in now to Back4App and start reaping the benefits of these excellent features. Hi ! , how to use ssl with custom domain ? can I use ssl on myapp.back4app.io ?